This interview was originally published in Sega Newspaper in Bulgarian on 6 February 2018. Mr. Singer, what is the purpose of your visit to Bulgaria? There are two main purposes. The first is to visit with the Bulgarian Jewish community, represented by the Shalom organization, which plays a very important role. It is a small community, but very active, led by the energetic president, Dr. Alexander Oscar. 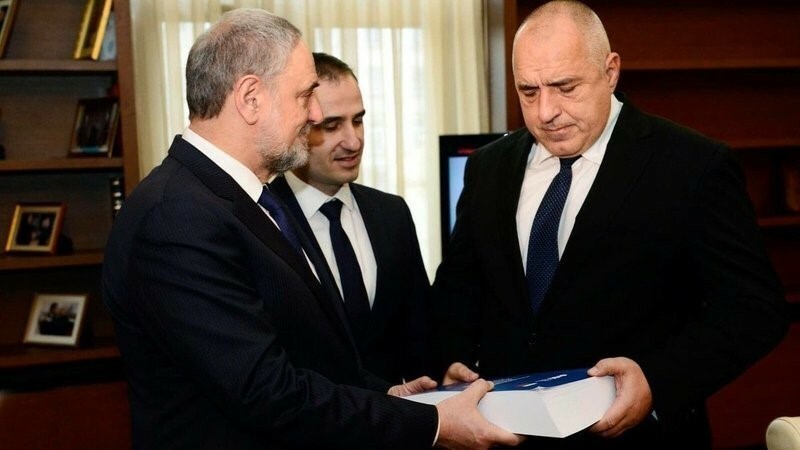 The second purpose is to hand a petition to the Prime-Minister Boyko Borissov, so far signed by 175 000 people from all over the world, against the Lukov March, planned for 17 February. What does this petition say? It contains a request to the government to cancel the march. What is the reason for this request? This is a neo-Nazi march. It is not only against the Jews, but against democracy in Bulgaria, against the Bulgarian people. Every year, neo-Nazis from various countries congregate for this march. We know that this is a marginal occurrence, that the Bulgarian people do not support it, that the government also does not support it, and that the Mayor of Sofia has been trying to cancel it for three years in a row, but it still persists. The initiative for the petition does not come from the Jewish organization, but from many other people. When the organizers of the march applied for a permit, it was met by opposition from indignant people who see this as incompatible with the good relations between the Israeli and Bulgarian people. Bulgarian citizens, too, have signed the petition. Judging by the names, the majority are not Jews. Does the government agree that the march is neo-Nazi? It is not a question of agreeing, but in rating it as a negative event, better to be banned than to exist. The march is in the name of General Hristo Lukov, who supported the neo-Nazi laws in Bulgaria, and the deportation of Jews. You met with Prime-Minister Boyko Borissov and the Minister of Foreign Affairs Ekaterina Zaharieva. After they had accepted your arguments, did they agree that this march is a neo-Nazi manifestation in modern democratic Bulgaria? We do not interfere with the domestic affairs of your country. But we know that Gen. Lukov had Nazi beliefs and supported the Nazi ideology. Therefore, for us Lukov march is neo-Nazi. According to you, was there fascism in Bulgaria or not? On the 10th of March we will commemorate 75 years from the saving of 48,000 Bulgarian Jews. This is the important date for us, not 17 February. I hope that government leaders from both Bulgaria and Israel will be present at this commemoration. Whether there will be such a march on 17 February or not - this is indeed a marginal occurrence. But it should not be there. Waves of populism are flooding not only Bulgaria, but also other countries, therefore such events must be prevented. Your visit to Bulgaria coincided with the beginning of the legal proceedings against the alleged perpetrators of the attack against Jewish tourists in Burgas on18 July 2012. Critical articles appeared in the Israeli printed media that the indictment does not mention the Hezbollah organization as suspect organizer of the terrorist act. Must Israel establish contacts with the Bulgarian Supreme Prosecutor’s Office in order to clarify why the “well-justified proposal" of "Hezbollah" by the then Minister of the Interior Tsvetan Tsvetanov has lost its relevance? Without a doubt, contacts at the level of the ministries of justice and foreign affairs must be strengthened, and also between the security services. There is a small cloud (of doubt - Ed. ), but it must be dispersed. The words of the then Minister of the Interior (T. Tsvetanov - Ed.) were deemed (trustworthy - Ed.) by the European Union, the USA, the Israeli government, and series of meetings must be held to clarify this issue. Wonderful relations exist between Bulgaria and Israel, a visit by the Israeli Prime-Minister is expected in the following months, and I think that this issue will be discussed very openly. You had a meeting with Mr. Tsvetan Tsvetanov, already acting as Chairman of the GERB parliamentary group. Did the discussion involve his “well-justified proposal" from five years ago about the role of Hezbollah in the attack? He raised this issue, but we did not discuss it. He does not seem to me a person who makes frivolous decisions. I do not believe he has changed his mind. He shows wonderful logic, and I believe he was disposing with serious facts in support of his statement. Judging by the publications in the Jerusalem Post newspaper, the impression is left that regarding this issue there is discontent with Bulgaria. I think that there is no discontent, because the relations between the two countries are very warm. This rather refers to a misunderstanding, which must be clarified. There was investigation, there was cooperation between the police and secret services of both countries. If new documents and facts have appeared, they must be put on the table. How did the Jewish community in America react? They are also awaiting facts in order to find out what happened. What do you expect from Bulgaria as President of the EU Council during the next six months? We are hoping that Bulgaria will dedicate more efforts in the field of human rights and in combatting antisemitism in Europe. I think that the policy of your country in this respect is very correct. What is the lifestyle of the Jews in Bulgaria? This is my third time here. My previous visit to Bulgaria was three years ago. At that time, I met Dr. Alexander Oscar and asked him: Why does a person with his career - with superb education and possibility to work in another country - remain in Sofia, instead of going to London, for example, where there is a great shortage of physicians and he may receive a salary 5 or 6 times bigger than his present salary? He told me that he would never leave this place, that he considered himself first and foremost a Bulgarian citizen, because generations of his predecessors were born here. A lot of young people think likewise. They feel as full-fledged citizens who have influence on the things happening in this country. How many Jews are in Bulgaria? There are about 2,500 members of the Bulgarian Jewish community, but there are plenty of Israeli businessmen, and also students. It seems to me that the Jews in Bulgaria are 3,500-4,000 in total. Until the war, there were 48,000. Most left for Israel to create the new country. Even now there is a strong and united community of Bulgarian Jews. Whole regions were created by Bulgarian Jews. They adapted very fast and are believed to be exemplary immigrants. Famous doctors, professors, and officers in the army originate from these immigrants. Last year 500,000 Israeli tourists came to Bulgaria, because its name sparks a broad positive feeling.